Every student faces the question of ‘what next’ after class 12th and 10th. They have to decide a stream out of – Humanities, Science and Commerce, and the only career guidance she/he has is the opinion of their parents and the judgement of their teachers based on marks and the comments of their friends and neighbours. It is at this point that a career counsellor steps in and helps the child sail through these turbulent times. The objective of Career Counselling and Guidance is to bring a career awareness campaign among the students, parents and teachers at the secondary and senior secondary education. With the growth of competitiveness in the last two decades this has become a major concern for our education system. Career counselling workshop gives an understanding to the students about the importance of one’s academic potential, attribute, personality, talents, interest, expectation, resource, strength and weakness while choosing a course for a right career at the right time for a bright future. The career counselling intends to show the students a planned route to a career right in the school years keeping in mind all above attributes so that the students remain motivated and effective during the most difficult years of the school system i.e. 10th to 12th and helping them to choose an appropriate stream/career after 10th or 12th standard. 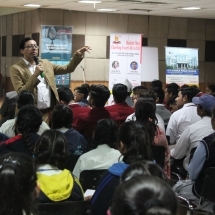 The school organized a career workshop on 26th November ’2018 by the renowned career counsellor Mr. Jitin Chawla and psychologist Dr. Aruna Broota . 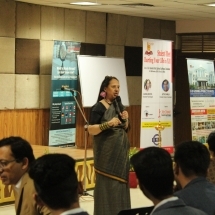 It was our endeavour through this counseling to bring the students and teachers together to understand the effectiveness of career counselling and guidance and make recommendations that would help students and the teachers to come as close as possible to a ‘match’ between the students profile and courses available. 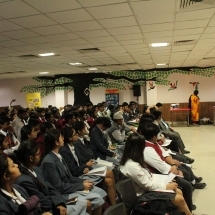 About 230 students of grade XII from different schools of NCR participated in the session. The interactive session specially focussed upon Goal Setting, Seeing Beyond the Horizon, Failure is a Stepping Stone, Winning Edge, Image Building and Positive thoughts, Time and Stress Management, Dealing with Expectations of Elders, Ethics and Values in life, Mind Mapping, How to remain Motivated, Hobbies and Personality Development.